Happy Friday! Another quick and flying week ... I'm surely very tired this week. We just 'passed out' last night, both me and my husband. I thought we woke up by alarm bell at 5AM and slept again until Audrey knocked on our bed room door, entered and then said 'Mom, it's already 6.20AM' ... wuahhh I jumped out of the bed, took shower and prepared breakfast for the kids. Bento was way too late to be prepared because the kids had to leave at 7AM from home. But after the crazy morning, I still managed to make bento for Audrey. My husband dropped the kids to school before went to the office. I made this bento with no one at home and it was more fun and relax. I will go to drop this bento to the school before lunch time at 12PM. And will wait at the Starbucks near kids' school until 2PM to pick them up. The owl was made with colored egg sheet (again) and as you can see, I used a lot of small cutters to make some details for the owl. The tree was made of celery. Inside the other box : sauteed Chinese spinach & corns, cherry tomato, prawns in tomato & garlic sauce, edamame, and fried fish cake. All of the foods in this box are Audrey's favorite. I didn't make any bento for her yesterday so she just had lunch from school catering with Andrew, who still 'refuses' to bring bento to school :p Some friends from my Junior High will have dinner at our house on Saturday and guess what ... I will be going to a baking class on Sunday. I will start from the simplest class first - 'making cookies'. Wish me luck, hope I can overcome my fear to bake LOL :D Wish you all a great weekend!! Wow Lia, if I were you I would wake up late and make a leisurely bento to drop off at 12 every day (lazy lazy me!) haha! Have fun learning to bake. I'm not much of a baker myself. I think baking is hard to do. 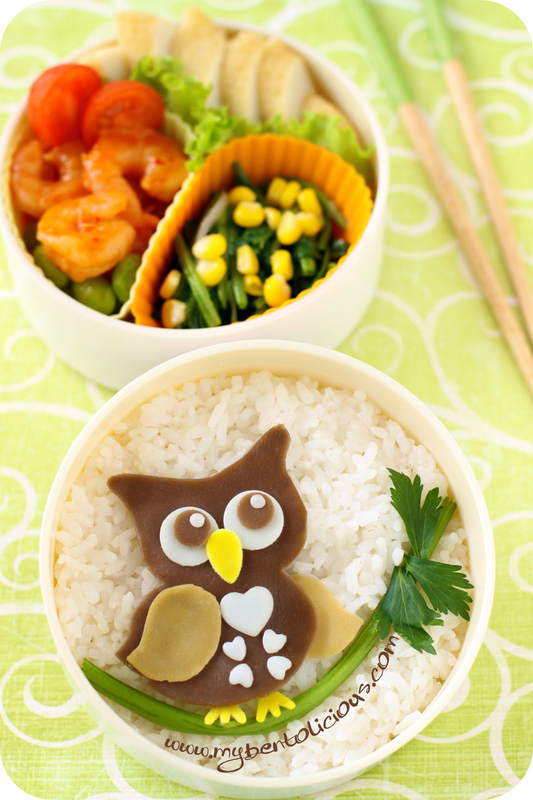 If you can make this super beautiful owl bento...you can bake cookies. What a hectic day! But you're a great mom you make bento completely at that busy time. Another cute bento, Lia. Love your owl so ,uch with those heart shape details and the BIG eyes. Making cookies is fun :) Especially for kids. Wow.. you were late and still had time to make this awesome bento? I mean it's really... awesome! lol. Have a great weekend Lia.. and have fun at your baking class! Looks very cute and tasty. baking class sounds so fun, wish i could come! Mbak liaaaaa, how are u? long time no visiting ur blog, n i miss a lot of new creations of yours. U're still d great one mbak !. Wow! Your owl is perfect! You did a fantastic job! Oh yeaH! You are a super mom :). Might be so nice to prepare bento without much hurries... (eh, I am thinking about ways to be lazy as well ahahah ). You did it again. You are just amazing!! I simply cannot wait to see what you come up with next. But guarantee, it will be just as good ... if not better, than the last! What a creative use of celery. I'm curious what the white parts on the owl are from. They look so white! Ever think of writing a book?? @HitomiNeko : Thanks a lot Hitomi for your kind comment! @Jenni Price Illustration : Thanks a lot Jenni! @3snahousedesign : Thanks a lot Esna! So did you have a great time in the baking class? I don't think baking will be any problem for you with your skills! cute little owl,love that celery stick it was standing on..
Don't think I'll ever have peace till my girl is in school! hahaha That means another 4 years from now! @Angeleyes : Be patient, that 'freedom' will come to you soon hehehe ... Thanks a lot Alice! Your kids are the luckiest kids! to have such and amazing mommy like you. Oh Lia! The owl is amazing! I love how you have him perched on a branch too! @Mischievous Mack : Thanks a lot!